HENRY BUTTERWORTH and ISABEL ASHWORTH were probably born around 1680 in the reign of James II. By the time they married, William of Orange and Mary II had taken the throne and set the country on a firmly Protestant course, and now Mary’s sister Anne was queen. Both Henry and Isabel came from the Forest of Rossendale in Lancashire. HENRY BUTTERWORTH. A possible baptism for Henry is on 23 Mar 1683/4 at St James, Haslingden, in Rossendale. The Latin entry gives his father as Henricus Butterworth. His mother was probably Grace Whitecre. The family were living at Goodshaw. This Henry would have been 23 when he married. Henry senior and Grace married in 1663, so there may be older siblings not yet transcribed, or there may be another baptism for Henry Butterworth yet to be discovered. There is a possible sister 10 years younger. Henry Butterworth used St Nicholas, Newchurch, for the baptisms of all his children, so it is likely that both he and his bride were living in this area when they married. ISABEL ASHWORTH. There is a possible baptism for Isabel at St Nicholas, Newchurch, in Rossendale, on 28 Sep 1673. This Isabel was the daughter of George Ashworth. The family abode was Edgside. This is a mile north of the Rawtenstall-Bacup road. This would make her 34 at the time of her marriage, rather older than expected, so there may be another baptism yet to be found. The Ashworths were a considerable landed family in the Forest of Rossendale. We do not yet know how Isabel was related to them. There is an Ashworth Road in Edgeside. Marriage. St Nicholas, Newchurch in Rossendale. 1707 December 25. Henry Butterworth to Isabell Ashworth de Rossendale. There seems to have been a strong link between these two families. Ten years earlier, a Henry Butterworth had married An Ashworth, and in 1708 yet another Henry Butterworth married Alice Ashworth. There are many children recorded in the Newchurch parish registers for children of Henry Butterworth. The mother’s name is not given until 1726. The overlapping dates mean that there were at least two men of that name raising a family there. One of these gives his abode consistently as Hilend. Elizabeth Butterworth who married Robert Priestley in 1733 seems to have come from the other family. She brought up her family in Brex, which is one of the residences of this Henry Butterworth. The Butterworths moved to several homes around this locality. When their eldest daughter Elizabeth was baptised in 1709 Henry was described as ‘de Rakehead’. This is a small settlement just south of the Rawtenstall-Bacup road. 18 Feb 1710/1 Henery. Abode: Brock. 1 Feb 1713/4 Janet. Boothfould. 21 Dec 1716. Alice. Brex. 24 Mar 1722/3 ?. Abode: Carr. Notes: writing faded. 22 May 1726. Alice. D of Henry and Isabel. Carr. We cannot rule out the possibility that some of these are the children of a third Henry Butterworth, but the dates are consistent with this being a single family. Brex was on the heights above Constable Lee, just north of Rawtenstall. In 1720 they were at Dein. They eventually settled at Carr. At Henry’s burial this is further identified as Carr Head. 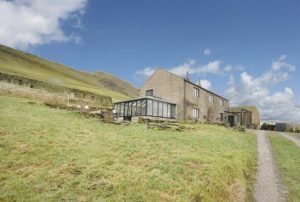 There is a Carr Head Farm above Rawtenstall. It is likely that this was where the Butterworths lived. Newchurch is only a mile or so away. In 1700 and 1704 there were also baptisms for children of Henry Butterworth who was living at Carr. The relation of these two Henrys is unclear. Isabel’s name does not occur again in the baptismal register. She died in 1727. Isabell, wife of Henry Butterworth, was buried at Newchurch on 27 Dec. The baptisms continue for children of Henry Butterworth. 15 July 1732. Ann. D of Henry and Ann. Carr. This Henry Butterworth of Carr, husband of Ann, is probably Isabel and Henry’s son, though we cannot rule out the possibility that Isabel’s widower remarried. Their daughter Alice was buried on 3 Mar 1730/1. There is a burial for Henry Butterworth Snr on 7 Nov 1753. Abode: Carr Head. Tupling, George Henry, The Economic History of Rossendale, Vol. 86., 1927. Google Books.